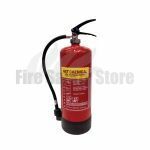 Wet chemical fire extinguishers are specifically designed to tackle Class F fires involving cooking oils and fat. The obvious place to keep or store them is in kitchens and restaurants where cooking oils are commonly used. 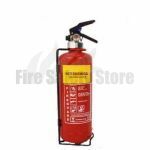 Wet chemical fire extinguishers are sometimes referred to as “F Class fire extinguishers” and should be Kitemarked to BS EN3 standards with a 13A/75F fire rating to ensure that they are both legal and effective. 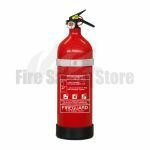 It is the only type of extinguisher that should ever be used on kitchen fires. They work by instigating a chemical reaction with fats and oils. This reaction reduces the temperature and eliminates the heat aspect of the fire triangle, causing blazes to die down. Wet chemical fire extinguishers have a unique lance which allows for application from a safer and further distance. A layer of cooling foam is emitted and forms on top of the burning materials. The reason that no other type of extinguisher should be used on Class F fires is because they have pressurised jets. This pressure can result in burning oils and fats to be carried out of pans and end up in other surfaces and areas, creating a larger and less controllable blaze. The same standard colour coding rules apply for all British fire extinguishers. In the case of wet chemical canisters, the body must be read and comprise of a yellow label for identifications and safety purposes. Wet chemical fire extinguishers have been proven safe for use on Class A fires containing solid materials but their effectiveness in tackling such blazes isn’t as good as other available types of extinguisher. Wet chemical extinguishers may give off toxic fumes in the chemical reaction process which can continue to linger long after a fire have been put out. Because of this, all rooms should be well ventilated and aired out after an extinguisher has been operated. The obvious alternative to wet chemical fire extinguishers are fire blankets. They are also designed with kitchen fires in mind. It is vital that businesses which operate with cooking oils and fats have both of these products to make sure that the workplace is as safeguarded as possible. 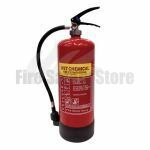 To learn more about wet chemical fire extinguishers, including how they work and why you should have them in your home or business, contact us today and a friendly member of our team will be happy to take your questions. You can call us on: 0800 316 0890 free of charge. Place an order for any of our onsite products before 2pm on a working day and you will receive your goods the very next working day.